Everyone loves jeans, but sometimes they're just not quite right for work. These Wrangler Workwear Men's Navy WP70 NV Plain Front Canvas Work Pants are professional, durable, and comfortable -- an excellent alternative to jeans. Made in a tough 7.5-ounce canvas ... (see full details) (see specifications) #WRGWP70NV. Everyone loves jeans, but sometimes they're just not quite right for work. These Wrangler Workwear Men's Navy WP70 NV Plain Front Canvas Work Pants are professional, durable, and comfortable -- an excellent alternative to jeans. Made in a tough 7.5-ounce canvas weave, these men's work bottoms are durable and resistant to wind and water. The fabric is a blend of 60% natural, breathable toon and 40% lightweight, durable polyester -- a combination that delivers comfort and wears tough. These lightweight pants are finished for color retention, wrinkle-resistance, and stain release. Count on them to keep their good looks wear after wear and wash after wash. Cleaning is easy -- they're machine washable at home or in an industrial wash, light soil. Designed for working people, they have wider and longer belt loops to accommodate bulkier belts. These bottoms are styled with a lower rise than traditional men's work pants for a modern, comfortable fit. A full inseam gusset means there's extra fabric to provide plenty of room for movement, so you'll feel less restricted when you bend, stretch, climb, and squat...all those things you do when you work. Darts above the back pockets offer a better fit. Double-needle stitching throughout these workwear trousers adds durability, strengthening the design with two threads instead of just one. The double-needle stitching creates a clean appearance, too. Flat-front styling provides a clean, professional look, and there are plenty of pockets -- two 13-inch reinforced slacks-style pockets up front, and two set-in pockets in back, with a button closure on the left. Styled in navy, these men's pants go with just about everything, and are an excellent choice for uniform pants. There's a lot to like about these Wrangler Workwear Men's Navy WP70 NV Plain Front Canvas Work Pants. Order yours today from the workwear experts at Working Person's Store! I have a couple pairs of Dickies work pants and wanted to try these from Wrangler. The fit is slightly looser than Dickies pants which makes it easier to use the pockets for keys and phone. These pants don't have the iron crease down the leg as the Dickies, but no big deal. I will be purchasing a couple more pairs. Also like the double fabric-lined pocket bottoms. Waist and length are true to size. 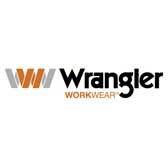 Wrangler Workwear Pants: Men's Navy WP70 NV Plain Front Canvas Work Pants is being added to your cart.